Botai horses. Photo credit: inform.kz. Recently some scientists, including yourself, have proven that the horses were first domesticated in recent Kazakhstan territory. Please tell us a little more about that. Thank you for giving me this opportunity. We think that horses were first domesticated very early in the Botai culture in modern Kazakhstan about 5,500 years ago. We have evidence that they were milking horses at that time. We found chemical evidence in the pottery that there was once kumys (fermented horse milk) present, which obviously is a key indication that domesticated horses were being milked. We also have evidence that they were ridden because there are marks on the teeth, which showed they wore some sort of bit. Also, we found in the structure of settlement, there are corral areas where they could have kept the horses. There are a lot of all the types of horse bones around the site which is another indication horses were being kept close to the settlement. If horses were hunted away from the site, only certain parts would be transported back to Botai from where they were killed. Then actually the fact that there is a large settlement with a very large number of horses is interesting. It is highly unlikely people could settle in large village and lived almost entirely from horses if they were only hunting them. The people who came before them were mixed hunter-gatherers. They moved around the landscape in small groups hunting different animals. But in the Botai culture they suddenly settled down, focused entirely on horses. And that almost certainly means true husbandry and looking after the horses. 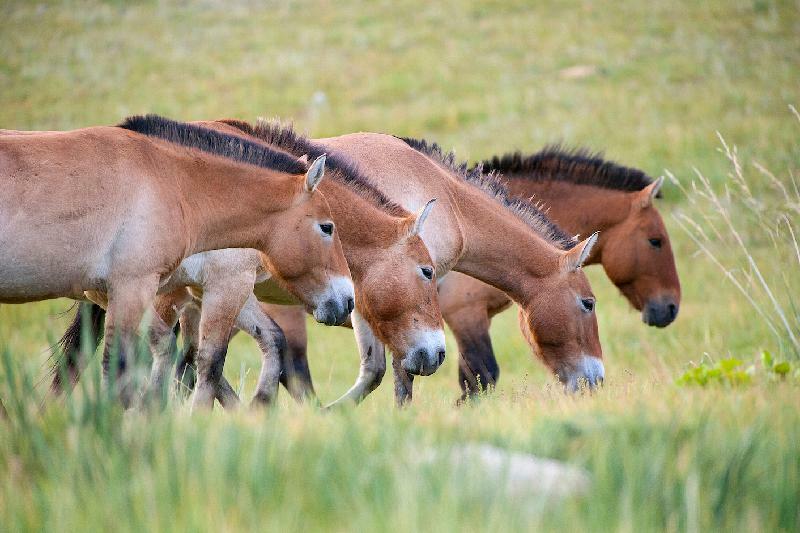 You and other scholars such as Sandra Olsen and Ludovic Orlando have said that horses from Botai were ancestors of feral Przewalski horses. In an article, you also stated modern domesticated horses did not descend from the Botai horses. Could you elaborate? We have done ancient genetics on the Botai horses and we know while they already domesticated horses, they are not the ancestors of modern domesticates. There is a small percentage of genetics in modern horses, which is related to Botai horses, but a later breed of horses became more predominant. We actually now know that Botai type of horses are similar to Przewalski type of horse. Whilst Botai horses are the first domesticates, modern domesticates relate to a later event. Have you excavated and researched human skeletons? Yes, we have also extracted the DNA of Botai people. We found that they are a very ancient group of people that are similar to the people that lived in the region during the Ice Age. So, a very ancient group of people were still living in the local area of Kazakhstan. They do not really have any modern direct descendants. They are quite closely related to some of the groups in Siberia, but also, they shared common ancestors with native Americans who way back in the Ice Age crossed into America. What modern technology or techniques have you found most helpful? We used analytical techniques as well as extraction of ancient DNA; we do a lot of chemistry of various types. We analysed the chemistry of fat residues to find out about their horse milk. Fat, in the fabric of an unglazed piece of pottery can be preserved for thousands of years. We are now trying to look for ancient proteins of the milk as well. Although that can be tricky because protein does not survive long periods of time as well as lipids, but we are trying that. We can also look to see where animals were moving around in the landscape from the chemical signatures in their teeth. Because where an animal eats records some of the chemistry from the geology of that area. So we can see even thousands of years ago where potentially an animal was feeding and how it was moving around in the seasons. So, we can see about study aspects of nomadism in pastoral movements. How did horses contribute to the development of human civilisation? Domestication of horses is an incredibly important event in human history worldwide. Because if you think about it, the domestication of the horse created the fastest form of transport until the steam train. Actually, for most people until the common use of the motor car. So just think about changing from walking to having a horse and how that affected people in terms of being able to trade, migrate and [conduct] different types of warfare. Actually, if we start thinking about things like fast movement and different types of warfare, then a slightly later development, which is also in the Kazakhstan region, is very significant. There is another culture in the area of trans-Ural region, Russia, also Northern Kazakhstan and it’s about 4,100 years ago. They were the very first people to have chariots and were clearly warriors. Certainly, they were using horses in warfare to some extent as well. So, another major development and something else was happening very much in this region. Have you tasted horsemeat and milk? Yes. I have certainly tasted horse meat and drinks, drank kumys. In fact, yesterday I had a horse milk ice cream. It was slightly strange.